When I was a kid, my parent’s friends from Alberta, Ted and Carol-Ann, bought a really old farmhouse down the road from our cottage at Oak Point, New Brunswick. They called it the Oak Point Inn. It looked like a haunted house. It had no electricity, no indoor plumbing, an awesome back staircase and what seemed like 1000 rooms when I was young. We had so much fun in that house. Playing hide and seek, pretending it was haunted and exploring every nook and cranny. We shared many meals there and after dinner when it got dark, we lit lots of candles and glass oils lanterns and huddled in to play boardgames or cards. Needless to say, I have many memories of the Oak Point Inn but one of my fondest ones was making cardamom bread with Carol-Ann from scratch. I was pretty young at the time but she was patient and let me help at every step. I remember feeling very proud of myself when it was finished. And it was delicious. Over Christmas this year, my Mom suggested we make Carol-Ann’s cardamom bread recipe. So we did. And I’m sharing it today. I know you are probably thinking that cardamom bread sounds like it would be a savory bread. But it’s not, it’s actually a very sweet bread. Now, I cheated a little and made the dough using the dough setting of my mother’s bread maker, but I’ll share the manual instructions below in brackets for those of you who do not have a breadmaker. Check you breadmaker instructions for dough recipes and add all your ingredients in the order they are required. Set you breadmaker to the dough setting and turn on. ALTERNATE (no breadmaker): Dissolve yeast in warm water. Stir in milk, eggs, sugar, salt cardamon, and 2 cups of the flour. Beat in melted margarine until smooth and then add remaining flour. Cover and rest 15 mins. Turn on floured surface and knead bread. Place in greased bowl and let rise until doubled in size. Punch down. Split dough in half then split into 3 equal pieces. Create 3 long tubes of dough that are roughly the same size. Braid three pieces. Do the same for the other half of the dough and let rise again until doubled in size. Whisk together the egg yolk and milk, and coat the loaves with it. Sprinkle with sugar and sliced almonds. Bake for 20-25 mins. And voila! Tasty sweet cardamom bread. The bread tasted just as I remembered it from all those summers ago. I think that the best recipes have a dash of nostalgia. They eventually sold the farmhouse and Carol-Ann is no longer with us but many memories are wrapped up in this recipe. I should also mention that I recently discovered that Carol-Ann’s daughter, Jody, who also spent some summers at the Oak Point Inn, is also a blogger in Calgary at Travels with Baggage! I’m telling you the power of social media for re-connecting people is pretty amazing sometimes. This morning I’m sharing a crowd pleasing recipe from the cover of this month’s Canadian Living magazine. With grilling season in full swing, why not make the absolute most use your grill with this yummy dessert? Grilled Peach Melba Sundaes with a raspberry sauce are T.A.S.T.Y. I recently made this recipe for some friends and it was a hit. And it’s really easy to do. The raspberry sauce was sweet and delicious and the best part is you can easily make it ahead. Also, if you make a little extra you could use it for other things too. Maybe add it to a vinaigrette to make a sweet raspberry salad dressing? Once peaches are in season, this dessert will be extra sweet and delicious. I really loved this dessert. As you can tell from the slightly melted ice cream in the photo, I put the peaches on while they were still warm from the grill which made it ever better! My friends were also fans…. Aside from this dessert tasting great, it’s so easy whip up. The sauce and toasted nuts can be made in advance. And if you are already grilling your dinner on the barbecue you can then just throw on the peaches after and BAM! An instant light dessert, perfect for long summer evenings on the patio. You can find the full recipe here, or in this month’s Canadian Living magazine! *This is sponsored post. All opinions expressed are my own. I’m going to be frank with you, it’s rare for me to really enjoy a salad. A friend of mine often says, “you don’t make friends with salad”, and I tend to agree with that statement. It’s even more rare for me to sing the praises of a salad recipe. Well, this morning my friends, I’m singing a new tune. I recently tried Canadian Living’s Sesame Chicken with Fennel and Orange Salad recipe (which is their May cover recipe) and this salad was delicious. The recipe was really easy to follow, took no time to whip up, and the ingredients were all things I already had or could find easily at my local grocery store. I grilled the chicken on the barbecue which gave it a little extra smokey flavour. For the dressing, I substituted grainy Dijon mustard, with hot and sweet Russian mustard which made it extra tangy and sweet. This salad is a winner in my books. Crunchy, tangy and filling. You won’t feel like you need another meal after you eat this salad. And you can trust that if this salad skeptic is saying you should try this recipe, then it must be good. You can find the full recipe here. You can also see how other CL bloggers made this recipe, here. Enjoy! Note: This was paid post. All the opinions are my own. I only endorse or promote things on this blog that I truly support and enjoy. Did any of you go to the One of Kind Show in Toronto in the spring or at Christmas? Well, something I discovered in the food aisles (LOVE the food aisles) thanks to La Nougaterie Quebec….you guessed it, nougat. Until this discovery my exposure to nougat has been the tiny bits inside the Toblerone bar that make it so delicious. La Nougaterie had all sorts of flavours; chocolate, lavender, cassis, cranberry….and my favourite by far, orange. So I’ve been thinking that I need to try to make my own orange nougat. 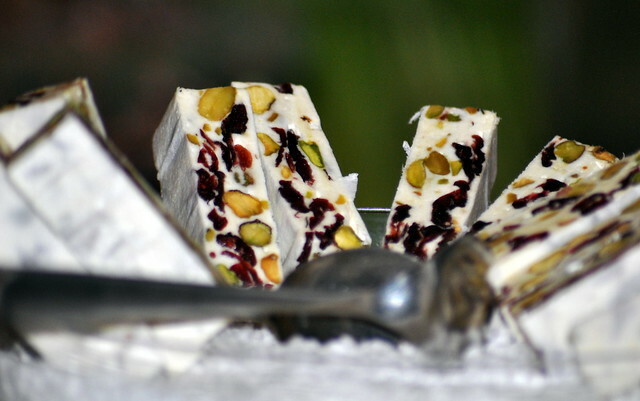 I’ve found a few recipes that look like they are worth trying, but the one that looks like it is closest to what I want is this Hazelnut & Orange Blossom Nougat from Pease Pudding blog. I get the impression that nougat is not the easiest to do successfully, so it may take me a few tries to get it right but I’ll keep you posted! 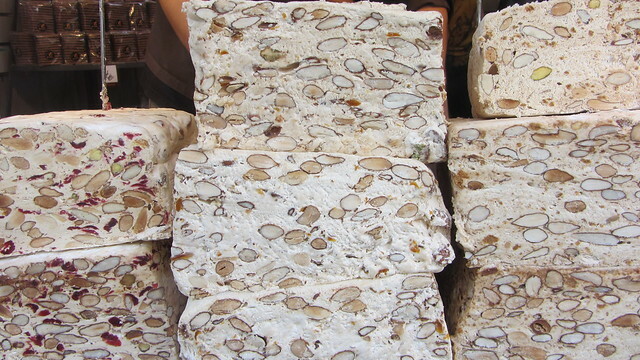 Have you ever tried making nougat?